To summarize, roof mount projects must use either string inverters with DC optimizers, such as SolarEdge or Tigo, or microinverters. The conventional method using 600V or 1000V DC strings and string inverters next to the array is no longer sufficient. The code requires optimizers or similar Module Level Power Electronics (MLPE) on all PV modules. Yes, you read this right. In which states does this apply? Any state that adopted the 2017 version of the National Electrical Code. As of October 1, 2018 over half the states already adopted it, with several more expected to adopt it before the end of the year. Look up your state here. What about Ground Mount projects? This does not apply to ground mounted arrays or carport canopies. Rapid shutdown only applies to solar on a building (it may apply to carports on top of a parking garage). 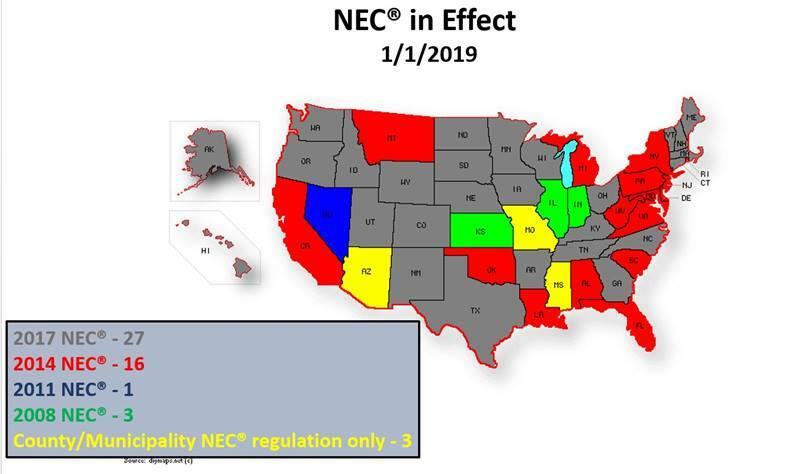 The National Electrical Code’s Rapid Shutdown requirements go into effect on January 1, 2019. What if my project starts in 2018 but finishes in 2019? If your permits are issued on or before December 31, 2018 you will be grandfathered into the previous version of the code that doesn’t require optimizers. However, if the permit isn’t issued until 2019 (even if you submitted the permit application in 2018), then you will need to comply with the new code and install optimizers. It won’t matter when you start or finish construction or get final permit approvals and PTO. The key factor is the date permits are first issued. There may be exceptions on a town by town basis, but this will be the most common interpretation by the AHJs for when a solar project does or doesn’t need to comply with the new code. What if there isn’t money in the budget for optimizers or microinverters? If you don’t have the budget to meet the 2019 Rapid Shutdown requirements, then you better get the project engineered, submitted for building and electrical permits, and issued permits in hand by December 31, 2018. Does Pure Power have any advice? Don’t wait until last minute if you want to get grandfathered into the current code. There is going to be a big rush in November and December as everyone tries to get in for permits. The permitting process slows down between Thanksgiving and New Years so get them started ASAP. Pure Power has 20 engineers ready to quickly design your system and get your permits approved before the end of the year. For help engineering your projects, reach out to us at info@PurePower.com or (201)687-9975. Yes this makes the projects a little more expensive, but it also makes them safer. I expect the industry to innovate and bring down the cost of Rapid Shutdown compliance so that in a year or two it won’t be an additional cost. Everyone says “safety first”…right?